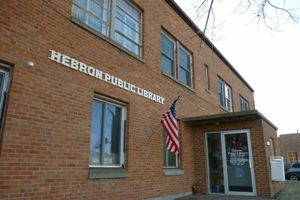 On Wednesday April 12th, 2017 the Hebron Public Library hosted an Easter party. We had “pin-the-tail-on-the-bunny”, ring toss, and a bean bag toss. We had a Story Time and Easter themed crafts. And thanks to local businesses such as Dakota Community Bank, Jack and Jill, and Dale and MarJean Sease we were able to give cookies out and prizes to every kid. Also, we owe a thank you to the Hebron Public Library Board members Roxane Walth, Mugsy Kitzan, and Jes Conlon, a dear friend of the library Violet Sease, Aly Dakken and Wyatt Dakken, and Trinadee White for making this possible! We had quite a turn out, more than expected, with 49 visitors!